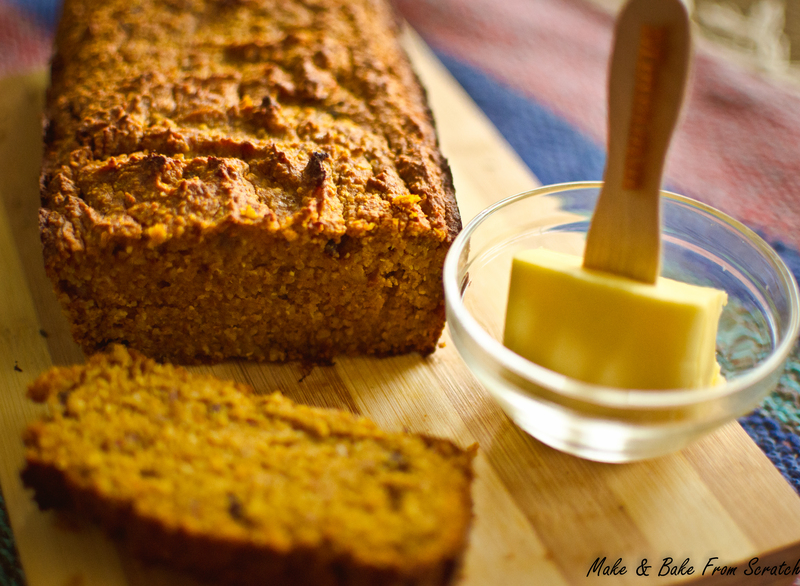 Treat yourself over the weekend to a delicious slice of Pumpkin Bread. I made this bread with my own homemade almond flour as opposed to store bought. The almond flour had a coarse texture but it tasted great and worked really well in the bread. To make almond flour I soaked (300 grams) almonds overnight, dried them out in the oven (70 degrees) for about 4-5 hours then blitz them in the food processor, pop them in a glass jar and bake till your heart’s content. The pumpkin bread is gluten free using almond and coconut flour. I added raw cacao nibs to give it that chocolate taste and dates were used as a sweetener. You can use honey or rice syrup (1/4 cup) if you do not have dates. This bread will have mouthwatering aromas flowing throughout the kitchen and is really worth the effort. I had a slice with melting grass fed butter and coffee. Make pumpkin puree alternatively you can use canned pumpkin. In a food processor blend the dates together to make a paste like consistency (do not add water). Remember to remove the stones. In a large mixing bowl add almond flour, coconut flour, sieve baking soda, salt, cinnamon and all spice, mix together. In a separate mixing bowl add pumpkin puree, melted coconut oil, melted honey, date paste, eggs and coconut milk, mix together. Pour the liquid mixture into the dry mixture and combine, mix well. Pour into a silicone bread pan and pop in the oven for 1 hour (this will vary with different ovens), until golden brown and firm in the middle. Insert a toothpick in the middle of the bread; if the toothpick comes out clean the bread is ready. Allow to cool before delving in.